In an earlier post, we discussed Ground Control Points as a primary method of obtaining survey grade accuracy from drone mapping. The photogrammetry/mapping software (such as Pix4d Pro Mapper) uses these GCP to make adjustments to the project to obtain survey grade accuracy. However, this method requires laying out and precisely geolocating numerous control points (approximately every 1000 to 1500 feet). Depending on the terrain and/or the size of the project, the GCP method could be very impractical, difficult and time consuming. Another, arguably more advanced method, is referred to as Real Time Kinematics (RTK), in which a Global Navigation Satellite System (such as GPS, GLONASS, Galileo or BeiDou) is used with a fixed (and precisely located) ground reference station to reduce and remove common positioning errors. In a nutshell, RTK GPS provides extremely precise geotagging of the exact location and alignment of the drone when each image is taken. This system enhances the precision of position data received from satellite-based positioning systems, does not require laying out Ground Control Points and results in the survey grade accuracy required for many applications. The base station (the exact location of which is known) monitors satellite signals and sends real time correction information to the rover user(s) through the communication channel. By combining the rover measurements with those of the reference station, these receivers can determine an exact position within the tolerance required. 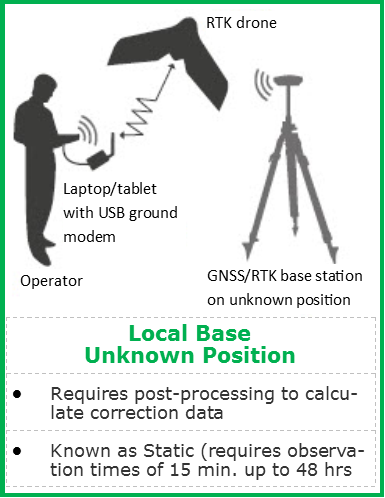 RTK relies on a data link between the mobile unit making the measurements and at least one other GNSS receiver providing reference data. This real-time link is absolutely necessary – differential GPS corrections can be applied in the field only as long as a real-time data link between the reference receiver and the mobile unit is maintained. Three common configurations of RTK as shown in the infographic below. 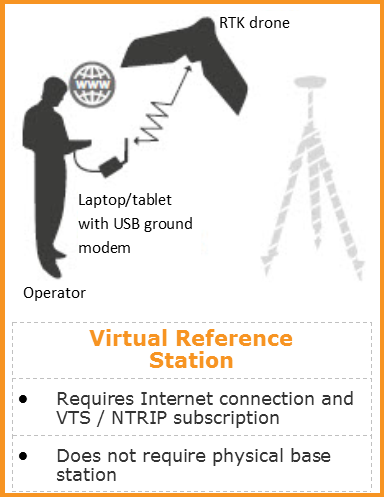 A Virtual Reference Station (VRS) subscription costs between $1,000-$2,500/yr. The user must be able to obtain an Internet signal (generally provided by cellular coverage) and accuracy degrades 1/5 inch/mile beyond 8 miles from a network base station. Most VRS networks cover the more urban areas of the country and cannot be used in many rural environments. Vertical Aspect can work with you to better evaluate the pros and cons of GCP vs. RTK accuracy for your particular application, experience level and budget. We can also make recommendations on equipment and provide you the necessary training (either face-to-face or via custom online sessions) in the entire drone mapping workflow.